I’m not sure if there’s an afterlife, but if there is, I reckon it looks like an all-night diner at three in the morning. You’ve been driving down this highway for hours, there’s nothing good on the radio; all the DJ’s have gone to bed, leaving the prerecorded programmes to see you through til the morning hours and you’re still a long ways off. You’ve been driving across the prairies, the coffee’s long since gone and your only company is an old tape in the tape deck and the vigilant gaze of your headlights, and if you killed those headlights you’re damn sure you could see the stars tonight. 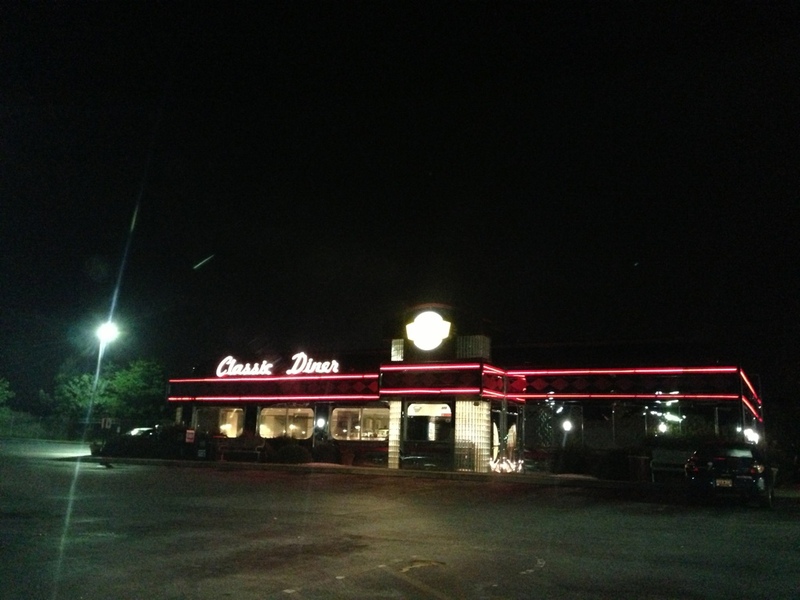 The diner’s sign is a neon hallelujah into the night that draws you in like a moth. The parking lot’s half-full, with ancient Thunderbirds and gargantuan semis dominating the wide expanse. The air outside is crisp, cool, and in the distance a sleeping city’s wandered into view, a span of suburbs lined with strip malls and gas stations and old trails to hidden lookouts only the locals know about. At the door of the diner, an old soul in a trucker cap smoking a cigarette gives you the faintest of glances as you pass inside. The first thing you notice when you walk into the place is the music; that song, that song you haven’t heard in years because you rarely ever come to places like this, is wafting through the badly-outdated speakers. The waitress looks like she’s been on the floor for a century without a break but she’s still smiling, asks if it’s just you and it turns out it is so she lets you pick any booth you’d like. She leaves you with a menu and a steaming cup of coffee black as the night you came out of, promising she’ll be back for your order in just a second sweetheart. And then you look around the diner because the menu and the coffee can only hold your interest for a moment, your eyes are still alive and bright even though your body’s long since given up on enthusiasm, and you take in the other wanderers who found themselves here at a quarter past three, of all the all-night diner’s in all the world. The granite-faced teamsters at the bar, the remains of their steak and eggs long since devoured, draining the dregs of the last cup before heading back to their mighty beasts in the parking lot. The travelling salesman, his sample case tucked into the booth beside him, savours each bite of hot apple pie like his own wife had made it before heading back to his cheap hotel to pass the hours between twilight and daybreak pining for her warmth, her laughter and the way her soul smiles. The young family, toddler long since given in to sleep, sharing a plate of french fries to keep them going, just so they can stretch that last dollar on gas a little further to make it north where the oilfields make promises they just might be able to keep; honest work, a roof, food on the table and toys for Junior that aren’t secondhand. And in that suspended moment, everything is right in the world. The air carries that sigh of satisfaction, the piped-in music hits the right note at just the right moment, and all of life is suspended for just this second in a halogen-lit tableau. All the weight you’ve been carrying, the mantle of responsibility from being at the wheel, dissolves and is drained away. Tired, cracked hands lose their pains. Foggy eyes are cleared. Maybe then, just maybe, you might realize you aren’t alive anymore. But I figure, if it were anything like this, you might not mind so much. You get asked for change an awful lot. that’s just the state of the nation. It’s not perfect, but you learn to live with it. for purses and shopping bags. a T Rex won’t make you an appetizer. why didn’t I give her more? made sure she had cab fare and then some. “But what if you just got got? the hardest in the ribs. and an Aldo shoe box.